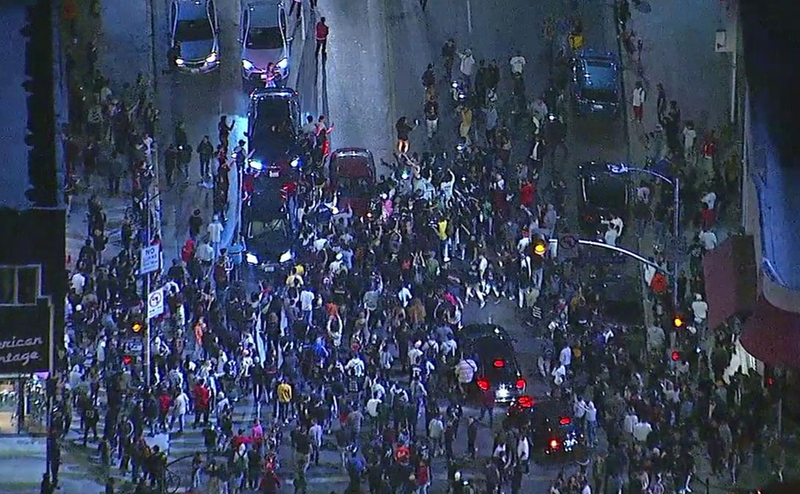 A makeshift memorial wake for slain rapper XXXTentacion (real name was Jahseh Onfroy) erupted into rioting Tuesday night as some 500 fans blocked a portion of Melrose Avenue and the crowd got rowdy when police moved in. At around 8pm local time, police received a call reporting a rowdy crowd in the area of Melrose and Spaulding avenues. As can be seen in the various videos, people crawled on rooftops and cars whilst the police at first took on a waiting position. As the crowd got too large, the police blocked off the road around 9.30 pm. One of the fans explained: "It was really good. Everybody seemed happy and positive and singing along and everything like that. Then it just got way overcrowded." Officers then moved in and fired pepper balls and rubber bullets to disperse the group. In response, according to police officers, the crowd threw rocks at them as well as other items. An anonymous fan declared: "I don't know how they can just bring out the cops. We're just people trying to like remember their favorite artist because people really impact other people by their music. This is how people get through things." By 10.30 pm, the crowd had been dispersed. The famous 20-year-old rapper, an avid fan of shocking scenes in his videos, was shot to death Monday in Deerfield Beach, Florida. According to authorities, Mr. Onfroy was leaving RIVA Motorsports when two armed suspects approached him and opened fire. what do you expect from monkeys?